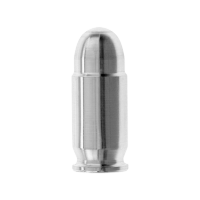 Buy 1 oz Silver Bullets .45 Caliber ACP | ?? 1盎司.45口径ACP银弹 Each 1 oz Silver Bullet is made from 999 pure silver and is modeled after the ammunition for the .45 Automatic Colt Pistol. The bullet is 30.6 mm (1 7/32 inches) tall and 12.1 mm (1/2 inch) wide. They are based on the ammunition designed by John Browning in 1904 for the Colt semi-auto .45 pistol and M1911 pistol that was adopted by the US Army in 1911. Browning also created various other guns, gun mechanisms and ammunition for both military and civilian guns alike. Although these bullets are purely decorative and are not intended to be fired from a weapon, they will help protect your wealth and prepare you for a stable financial future. Silver bullets make great gifts for anyone interested in gun rights and silver collectors alike, and they are a great conversation starter. Due to the inherent nature of bullion products, these may exhibit scratches or dents. Minor blemishes of this nature do not affect the quality or value of bullion products.